Another Friday...Another Bloggers Challenge to give you some inspiration! This weeks challenge theme is All about Texture. 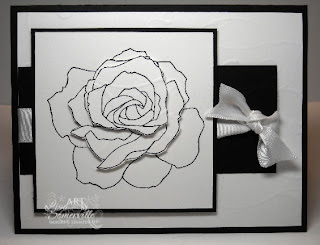 So grab your Embossing Folders and Texturz Plates and play along. I used the Texturz Plate on the white background and the popped up layers of the Rose. You're going to have to trust me on the "texture" part of my card. If you click the photo to enlarge you'll actually see the texture. Getting the texture to photograph on white card stock isn't so easy. Looking for more inspiration see what the Bloggers Challenge Players created. Be sure to check back this weekend, I'll be posting some samples with new JustRite Products! Very elegant Lisa - might have been hard to photograph, but I can see the effect and it is stunning. Beautiful! I love this set done in black and white. It is hard photographing white texture...and the Kraft I used! Wow! This really looks great. It reminds me of a painting for some reason. Love how you layered the flower. 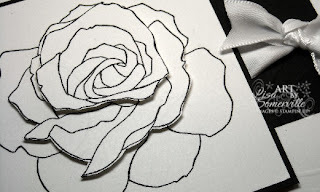 Gorgeous card, love that flower and you have it dimensional. so elegant! i love how you layer that rose...gorgeous!!! Very pretty, Lisa!!! so sophisticated! I love the multi-layers. its stunning. I like the clean and simple design of it. Really gorgeous. I bet it's striking in person. Love the elegance of the black and white combo. I can see the texture, too!!! Stunning.....classy.....elegant! This is a real WOW, yet so simple looking. Love it! WOW - this card is stunning, so very elegant! This is gorgeous, Lisa! I really like the layered flower image. This is so elegant! Love it. This is so pretty and ELEGANT! Love it Lisa! TFS!